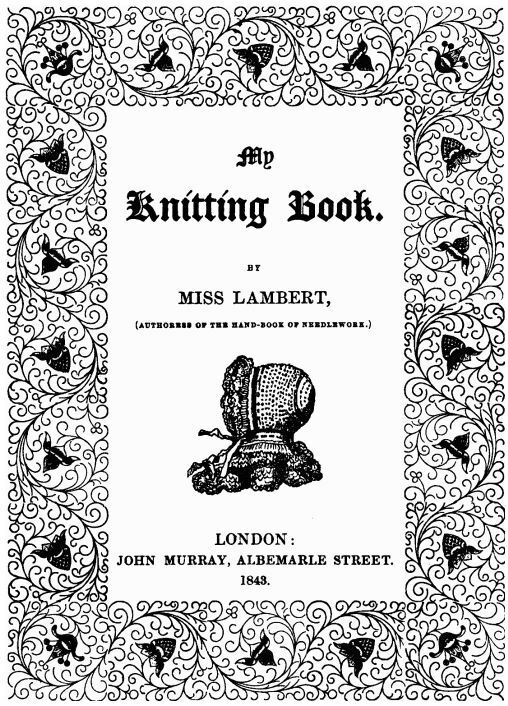 The 13th pattern in Miss Lambert’s 1843 knitting manual, My Knitting Book (First Series) is for an Opera Cap. At first, I considered skipping this pattern. I don’t imagine that I would ever have any use for an 1843 Opera Cap; however, as it always does, curiosity got the best of me, and I decided to give it a try. Now, I’m not sure about you but I certainly have never come across the term “opera cap” before, so I decided to see what I could learn before casting on this project. Now that I knew what my finished object will look like, I wondered, what was the purpose of an opera cap? Was it a practical or decorative accessory, or both? Unfortunately, I was not able to find much online about the use of opera caps – although there is a lot of information about the evolution of the opera hat for men. I found patterns for knitted, crocheted and netted opera caps with varying levels of ornateness from the 1840s and 1850s, so these were clearly a popular item to knit and wear at the time. I suppose the idea was that you could protect your modesty by keeping your head covered when outdoors on the way to a special event and maybe keep yourself warm in the process on a cool evening? Pure speculation but it sounds reasonable to me given the Victorian sensibilities. If you know anything more about opera caps or where I can learn more about them, please let me know in the comments below. Back to the task at hand, getting started with my opera cap. The pattern calls for No. 10 needles, double German wool or three-thread fleecy in two colours. In modern day knitting language, this is the equivalent of 4mm knitting needles and DK (double knitting) yarn. I will cast on and update you on my progress when I’m done. As you found, “opera caps” or “Opera hoods” were very popular throughout the period. I’ve made this particular one as well….and your reasoning is sound and correct, based on the research I’ve done for this period as well: they are both functional and fashionable…..houses and various gathering places were not always heated well, and since much of the body heat escapes from our head, our ancestors knew to keep pulse points (hence your muffatees!) and heads warm to preserve that heat. I’m enjoying your journey! Thank you! I am glad to hear I was on the right track! oh…and this particular one works best with the 1840s hairstyle, and yet oddly enough, shows up again in Peterson’s magazine, 1858! Does the short or long edge go next to the face? Can’t tell from the picture. Looking forward to seeing it made up. I believe it is the long edge!